We're sharing Christmas dies today - I decided to use this mitten die to make a cute and useful clip! I cut a white mitten first, then traced it to create a backing piece in red. I cut 2 chipboard mittens - with a single pass, the outline cut but not the design, so those were perfect for backing. I used a full size clothespin, and attached it with hot glue. The ribbon is laced through the cuff of the mitten - so fun! Great idea, and such a beautiful dies! Love that mitten die! So intricate. Fabulous project. Love that mitten die! What a cute mitten!! That's a great and creative way to use it! What a wonderful idea! I love the mitten. Thanks for sharing. Thank you for sharing this mitten idea. Looks great with the papers you used. What an adorable die!! I could see many uses for this on my Christmas projects. Your mitten clip is absolutely adorable!! This would also be really cool as a holder for a pack of markers, paint brushes, paints or other cylindrical products as a gift! LOVE it!! TFS! This is so clever. Love the big mitten! What a cute idea Dina - thanks for sharing! What a fantastic die and your idea! Great project! Love that mitten die! How awesome and clever ! Thank you for sharing your creativity with us. Lovely way to use the mitten die! Love the mitten die and how you used it. What a fantastic. creative idea. Cute mitten and very clever to make it a clip. Great project! Love that mitten die and the holly! Great idea using the mitten die. Really cute! Great idea for holiday decor, at first I thought it was a card. :) Love the ribbon detail. Thanks for sharing. Love the use of a clothespin - very clever! Well, aren't YOU clever! This is adorable. What a fun mitten! Your layered effect is so beautiful and really showcases the new die to perfection! Fun project/idea. Love the pretty mitten die. Really cute mittens! And the red and white is very stricking. Thank you for sharing with us! Great fun gift idea! As soon as I saw the mitten I imagined it white and backed with red too! Thank You for sharing along in this fantastic blog hop! Such a clever idea! It's cute and useful. Dina, that is super cute tag! Love your layer patterned paper, too :) THANKS for the inspiration, my friend! This is such a cute idea! I love how function and decorative it is. What a Great Idea!!! Love it!!! Cute creation, gives a lot of idea! Really like the mitten die and idea clipping onto the jar with paint brushes. Thanks for sharing. I like this die and cute idea with the clothes pin. Awesome paper choices! Love that cute mitten die! Great idea! What a fun way to add a little festiveness to your craft area. Would be great to give to give to your crafty friends, so they could too. I love the big mitten. Fun idea to make a clip out of it. 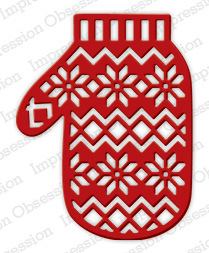 The mitten die can be used for so many uses-it's gorgeous in red and white! Love this mitten die! So versatile! And your clip is just too cute! How cute! Love the mittens dies! So many possibilities for that cute little mitten ... such a clever design. Great idea. 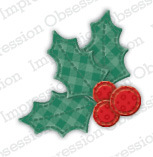 Love that mitten die and the holly too!!! Cute mitten, love how you are using it. How sweet is that mitten!!! And the glasses are a must have . What a wonderful idea. Adorable. How sweet! I thought this was a card, but you went one step further and made it a clip. The mitten pattern is so cute and now the recipient will be able to keep the clip to use over the winter and future winters, whereas a card may have been (unintentionally, of course) disposed. Thanks for sharing your great idea.